This is a very spacious house of 740 m2 including terraces etc., the house itself is 643 m2. There are five suites, large living and dining areas, elegant drawing room and an unusual kitchen which mixes bothe the contemporary with the ancient some of which dates back to the XIV centuary. 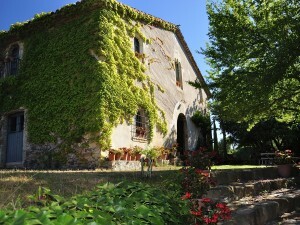 The house was totally renovated about 20 years ago maintaining character and integrity of the Masia the large spaces, the high ceilings with wooden beams, elegant dining rooms, the bread oven and many unique and special features. The improvements allows the house to be used all year round with the addition of under floor heating., wooden double glazing, etc. All materials are of premier quality and sympathetic to the property. The features of the house have been maintained. An outstanding feature of this property are the wooden doors which were made in the XVIII each one unique. The property is sold together with 100 hectares of land, the majority of this is under woodland of pine, cork and oak trees, the rest of the land, about 10 hectares is divided into fields for cultivation. Can Ciolomer is just 3 km from Riudarenes, about 30 minutes from the centre of Girona and an hour from the centre of Barcelona. Girona airport is approx 20 minutes away and the airport at Barcelona an hour.